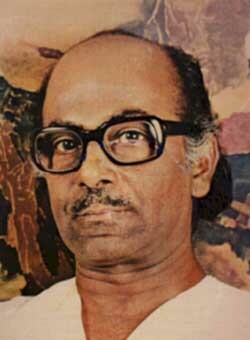 Last Sunday (19th November) was Salil Chowdhury’s birth anniversary. Although this multi-layered artist passed away eleven years ago, his stamp of exclusivity continues to sustain his livingness. A majority of Indians know Salil (popular among his admirers as Salilda) as a virtuoso music composer. So did I, for a good many years, leading into my college life. Salil’s music was hard to ignore for any lover of vintage-era Hindi film music. The earthy notes in Do Beegha Zameen or the Indianised version of a Hungarian folk tune in Madhumati; the poignancy of a day wearing down in Anand’s Kahin dur jab din dhal jaye or the strains of Middle Eastern music in Kabuliwallah—music, which didn’t slot Salil Chowdhury into any musician’s club, but established a separate league for him. For me, he was a genius. His versatility, the ability to make music that was internationally-influenced yet India-rooted, and his knack for getting the very best out of his singers easily made him stand out among his peers. One day, during my college years, Salil Chowdhury stunned me again. This time, with a side of his that had remained unknown to me all this while—as a poet-composer of songs of protest and mass awakening. Has woken up today, Your Honour. Will be crushed by their weight. Salil wrote this song in 1945, two years before India’s independence. It was a diatribe against the farce that was often carried out in the name of judicial hearing of Indian freedom fighters. The 1940s was also the decade when Salil Chowdhury joined the Indian Peoples Theatre Association or IPTA, an organisation of artistes and writers, born to address the conscientious role of the artistic community. As part of IPTA, Salil wrote many songs, beseeching his fellow countrymen to take power into their hands and rebel against exploitation by those in power. He wrote in simple Bengali, using words village folk spoke and voicing issues that concerned them. Stock the harvest in our granaries. Thus went his anthem for poor peasants who were perennially robbed off the rewards of their toil by shrewd, profit-minded landlords. The poet-composer didn’t stop at his creation, though. He took these songs to villages and soon these became people’s songs in the truest sense. It’s easy to see what inspired Salil to feel for the disadvantaged members of his community. As a young boy, he grew up in the tea gardens of Assam, where his father was a doctor. Chowdhury senior would routinely rope in the poorly paid coolies of the tea gardens to organise and stage plays against British exploitation. He also took part in many anti-British rallies, quite an audacious feat when the British were still ruling India. Although in the mid-fifties this brilliant song-writer-musician matured into an exceptional self-taught composer with the onset of his professional career in film music, he never lost touch with the man within who hoped for a classless society and envisioned an India that wasn’t touched by religious differences. He wrote his last mass song in the early 1990s, shortly after the demolition of the Babri Mosque by Hindu fundamentalist forces. It is night; don’t stop here. For more information and recordings of Salil Chowdhury’s brilliant compositions, visit The World of Salil Chowdhury. Wonderful to listen to Salil’s tunes and songs again ! And of course, he introduced Mozart (some said plagiarized, but I differ) in the song “Itna na mujh se tu pyar bhada”. And thus introduced many Indians unconsciously to Western music. In Hindi movies, he is mainly remembered for incorporating folk tunes- specially from the Garhwal area (in Madhumati, most prominently.) It’s a pity that he peaked so young, at least in Hindi films and one did not hear much from him. My favourites are those sung in the shimmering, silken voice of Talat MehmoodI had heard about his Bengali compositions, but not heard the tunes/ songs themselves. I am listening to his Bengali songs via the link to his site that you linked to.Thanks ! I pick up his distinct gift of artistry straightaway, Bhas. You are welcome, Bhupinder. That site is a treasure trove. Indeed, Salil Chowdhury never plagiarlised. Those who accuse him of that should be dared to try and plagiarise themselves and come up with results that have even a fraction of the creativity that mark Salil’s compositions. In “Itna na mujhse…” the situation is almost like two great composers shaking hands over some coffee. I don’t think Mozart would have minded at all. 🙂Cesar, many thanks for taking the time to read. I couldn’t agree more with you. 🙂Susan, good to see you drop by! Salil Chowdhury’s talent is hard to ignore, isn’t it? I hope you’re having a wonderful weekend. I wanted to say hello to everyone on my blogroll, and wish them well, because this is Thanksgiving weekend, and I am grateful for my Internet friends! Hi, Bhaswati!I look forward to your “Know the Writer” posts – being exposed to new (for me) literature gives me such a rush! Thanks so much! Yes, Bhaswati, do visit if you can, you might like the poetry meme I recently posted. Very nice post, and it’s really good to find that you have seen Salil as the writer that he was never rated very highly as. Salil’s contribution to what is known in the present day as “jibonmukhi” gaan is indelible. The tradition was carried forward by bands like Mohiner Ghoraguli, and all of it goes back to those simple melodies which Salil composed partly in disgust and partly in despair.O Alor Pathajatri was one of the first songs I ever played on the piano, and ever since then, I fell in love with his music, and his humanity.Wonderful blog, I am glad I stumbled on it by mistake.